da Silva, F. & Frega, R. (Ed.) (2012). Pragmatism and the Social Sciences: a Century of influences and interactions, vol. 2, The European Journal of Pragmatism and American Philosophy, 1. Frega, R. (2012). 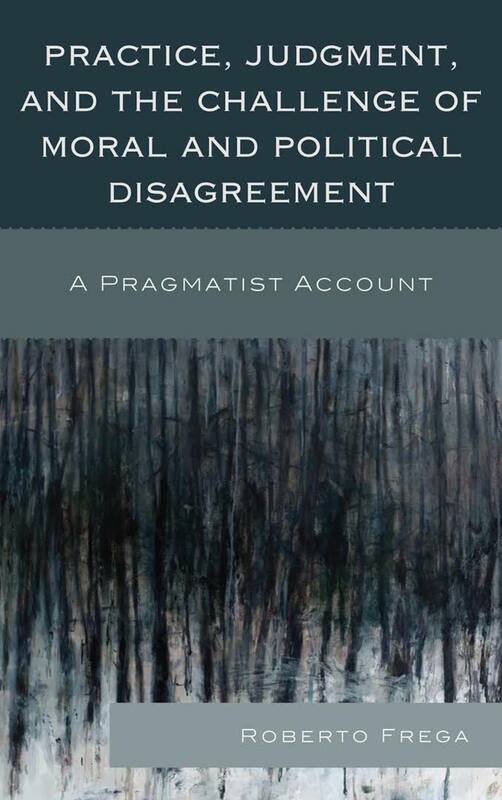 Practice, Judgment, and the Challenge of Moral and Political Disagreement. A Pragmatist Account. Lanham: Lexington. The book offers an account of moral and political disagreement, explaining its nature and showing how we should deal with it. In so doing it strikes a middle path between troublesome dualisms such as those of realism and relativism, rationality and imagination, power and justification. To do so, the book draws on the resources of the pragmatist tradition, claiming that this tradition offers solutions that have for the most part been neglected by the contemporary debate. To prove this claim, the book provides a large account of debates within this tradition and engages its best solutions with contemporary philosophical theories such as perfectionism, critical theory, moral realism, and liberalism. The question of the nature of disagreement is addressed both at the general theoretical level and more specifically with reference to moral and political forms of disagreement. At the more general level, the book proposes a theory of practical rationality based upon the notion of rationality as inquiry. At the second, more specific, level, it aims to show that this conception can solve timely problems that relates to the nature of moral and political reasoning. Festl, M. & Festl-Pell, D. (2012). Wirtschaftsethik – Individualmoral oder Rahmenordnung? Ein Beitrag zum Einfluss der Verhaltensökonomik auf die Wirtschaftsethik. Zeitschrift für Wirtschaftsund Unternehmensethik, 13 (2), 141-153. Festl, M. (2012). Vorsicht Grenzverletzung! Ein erkenntnistheoretischer Anschlag auf die Gerechtigkeitstheorie. In: Dunshirn, A. & Nemeth, E. & Unterthurner, G. (Ed. ): Crossing Borders : Grenzen (über)denken – Thinking (across) Boundaries, Beiträge zum 9. Kongress der Österreichischen Gesellschaft für Philosophie in Wien. Wien : Phaidra, 509-518. Frega, R. (2012). Frederick Will’s Practice-Based Approach to Normativity, Transactions of the C. S. Peirce Society, 47(4), 483-511. Frega, R. (2012). A Pragmatist Critique of Liberal Epistemology: Towards a Practice-Based Account of Public Reason, Critical Horizons, 13(3), 293-316. Frega, R. (2012). Equal Accessibility to all: Habermas, Pragmatism, and the Place of Religious Beliefs in a Post-Secular Society, Constellations, 19(3), 268-288. Frega, R. (2012). Morality is social : John Dewey e le fonti sociali della normatività. In: Vincieri, P. (Ed. ), Sul fondamento della morale, Bologna: D.U. Press, 71-90. Hartmann, M. (2012). Kann und sollte Demokratie epistemisch gerechtfertigt werden? In: Hartmann, M. & Liptow, J. & Willaschek, M. (Ed.). Die Gegenwart des Pragmatismus, Berlin: Suhrkamp, 280–310. Hetzel, A. (2012). William James. In: Oberprantacher, A. & Rainalter, H. (Ed.). Außenseiter der Philosophie, Würzburg: K&N, 231-246. Jörke, D. & Selk, V. (2012). Die Demokratietheorie des Pragmatismus: John Dewey und Richard Rorty. In: Ritzi, C. & Schaal, G. (Ed.). Zeitgenössische Demokratietheorie. Wiesbaden: Springer-VS, 251-28. Langner-Pitschmann, A. (2012). Die Moderne als Schauplatz des Tragischen? Überlegungen im Horizont von John Deweys Pragmatismus. In: Herausforderung der Modernität. Festschrift für Hans-Ludwig Ollig zum 70. Geburtstag. Würzburg: Echter, 159-186. Langner-Pitschmann, A. (2012). Virtue versus Piety. MacIntyre and Dewey on Acknowledging Dependence. Ars Disputandi, 12, 4-11. Müller, M. (2012). Wir liberalen Ironiker? Richard Rortys transformative Begründungsutopie. In: Schreyer, B. & Walkenhaus, R. (Ed. ): Ideen – Macht – Utopie. Festschrift für Ulrich Weiß zum 65. Geburtstag. Würzburg: Ergon, 403-419. Nungesser, F. (2012). Three Dimensions of the Sociality of Action. Some Reflections Based on the Cultural Psychology of Michael Tomasello and Sociological Pragmatism. European Journal of Pragmatism and American Philosophy, IV(1), 178-207. Salaverría, H. (2012). Enjoying the Doubtful. On Transformative Suspensions in Pragmatist Aesthetics. European Journal of Pragmatism and American Philosophy, 4(1), 247-254. Ebd. : Eine Erwiderung von Richard Shusterman: Reviewing Pragmatist Aesthetics: History, Critique, and Interpretation – After Twenty Years. Steiner, S. (2012). Notizen zu Hans Blumenberg. Religionsphilosophie zwischen Atheismus und Kritik der Philosophie. Journal für Religionsphilosophie, 1, 44-52. Viola, T (2012). Peirce and Iconology: Habitus, Embodiment, and the Analogy between Philosophy and Architecture, European Journal of Pragmatism and American Philosophy, 4 (1), 6-31. Volbers, J. (2012). Wittgenstein, Dewey, and the Practical Dimension of Knowledge. European Journal of Pragmatism and American Philosophy 4 (2), 105-117. Jung, M. (2011). Verkörperte Intentionalität – Zur Anthropologie des Handelns, in: Hollstein, W. & Jung, M. & Knöbl, B. (Ed.). Handlung und Erfahrung. Das Erbe von Historismus und Pragmatismus und die Zukunft der Sozialtheorie. Frankfurt/Main: Campus. Steiner, S. (2011). Der unabschließbare Prozess der Interpretation. Religionskritik und Kulturkritik als Doppelgänger und Widersacher. Fuge – Journal für Religion und Moderne, 8, 101-120. Sölch, D. (2011). From Consistency to Coherence. Whitehead’s Transformation of James’ Epistemic Conservatism, European Journal of Pragmatism and American Philosophy, 3(1), 86-100. Viola, T. (2011). Philosophy and the Second Person: Peirce, Wilhelm von Humboldt, Benveniste, and Personal Pronouns as Universals of Communication, Transactions of the Charles S. Peirce Society, 47 (4), 389-420.